Affordable Motorhome hire conveniently located on the doorstep to the Lake District, Yorkshire Dales, Northumberland and Scotland. Motorhome hire is a growing trend for those people considering a holiday in the UK, with the freedom to travel, explore and wake up to a different view as often as you like. 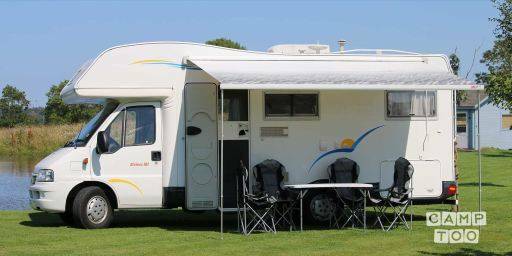 Our Motorhome has all the luxuries on board to enjoy your time away whatever the weather. Fully equipped with Air Conditioning, T.V, Fridge, Shower and includes clean warm bedding, out door furniture for 6 people meaning all you need is clothes, toiletries and food then off you go. Je kan de camper ophalen in Hutton Magna bij Beverley. Je kan je auto hier gratis parkeren.